Chicken, the versatile protein. Chicken is one of my favorite meats to cook with…. grilled, roasted, boneless, skinless… you can get this bird in so many ways. On the weekends when I have more time to cook, I usually roast a whole bird in the oven for a few hours with some winter vegetables. But on weeknights when there is only about 30 minutes to cook up something healthy, I turn to my gas grill. Oh yes, we grill year round over here in the Pacific NW! Rain? No problem! Out on the patio we have the grill covered so we can use it year round. These are also healthy too. Boneless, skinless chicken breasts grilled in under 10 minutes with rosemary, salt and pepper makes this sandwich tasty! Add some fresh spinach, and dijon mustard and top with light brie. A great, healthy weeknight dinner in less than 20 minutes. I found individually wrapped brie slices that are under 60 cals per wedge, also making this that much easier to throw together when time is an issue. Who says you can’t make a healthy dinner in less than 30 minutes?! trim all fat off chicken breasts and pound to an even thickness. grill 4-5 minutes per side until no longer pink in the middle. grill buns for about 1-2 minutes. 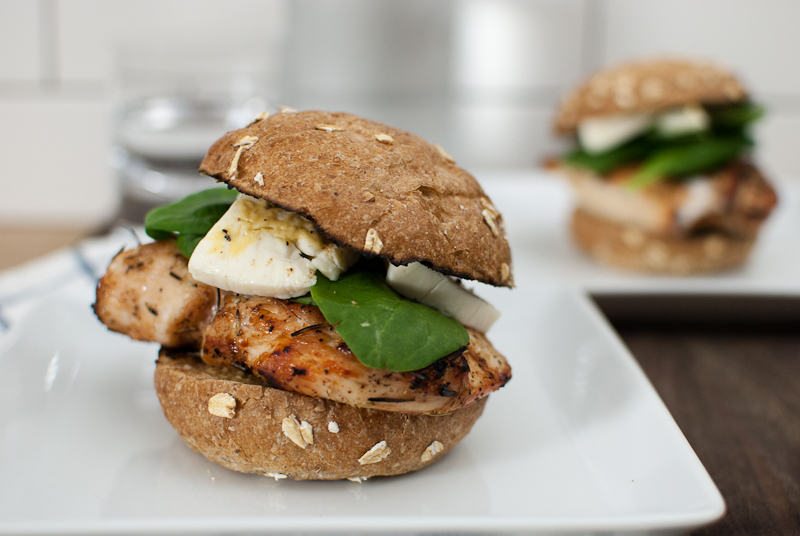 assemble chicken burger with dijon mustard, spinach and brie. I love chicken, but I know my father hates it. He is more of a red meat man, but whenever he leaves out of town I will definately make this! 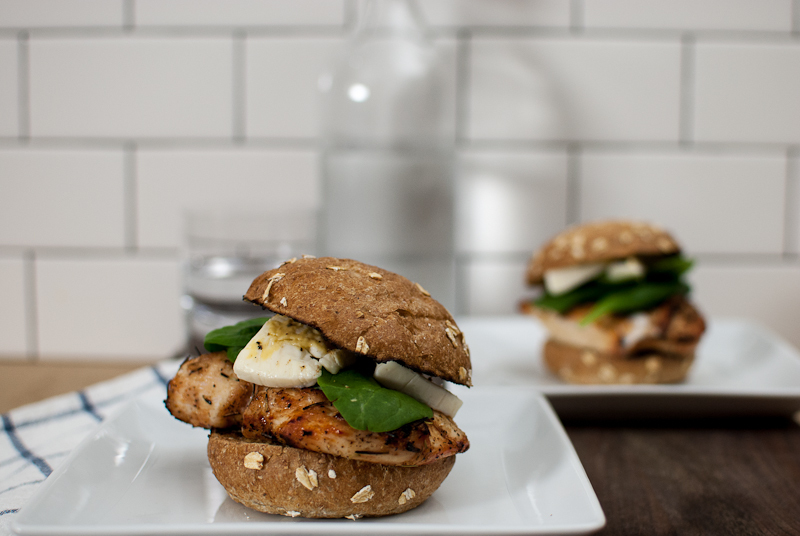 Great idea to top this chicken burger with brie–totally trying that one out!